More soup! 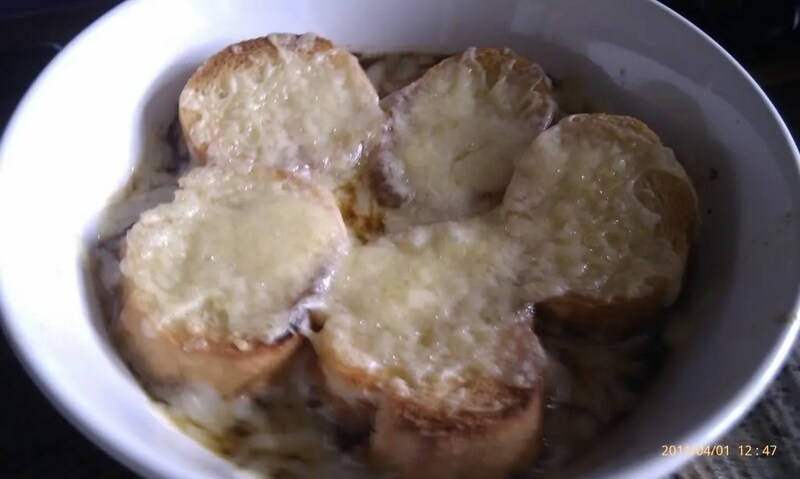 As previously mentioned, I’m not very precise when it comes to soup, but soups are generally very forgiving so just go with what you have, taste as you go and it’ll be yummy! 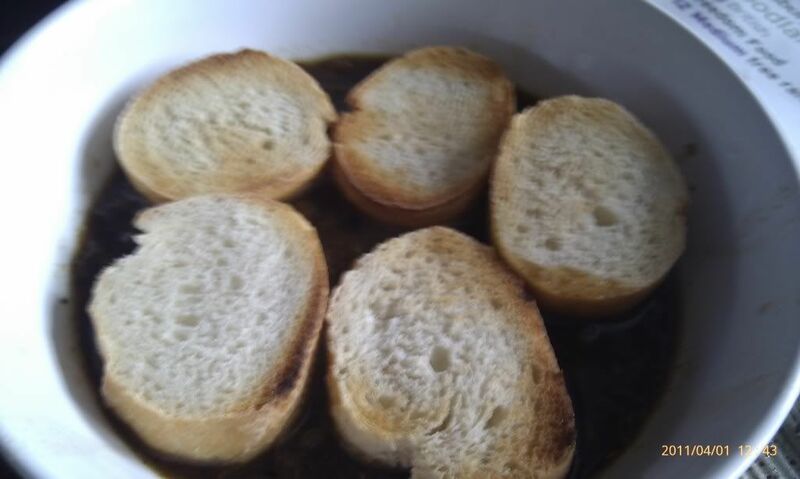 My second Super Easy Soup Recipe is…. About 1 Clove of Garlic for every 1-2 onions, depending on how big they are and how much you like garlic. I’m using a large oval saucepan/casserole dish on a low heat. I started by melting about 100g (4 oz) of butter in it, together with a good slosh of olive oil, which helps prevent it from burning. Add a good tablespoon or two of dark sugar (I prefer a mix of dark muscavado and molasses sugars as they add gorgeous richness). 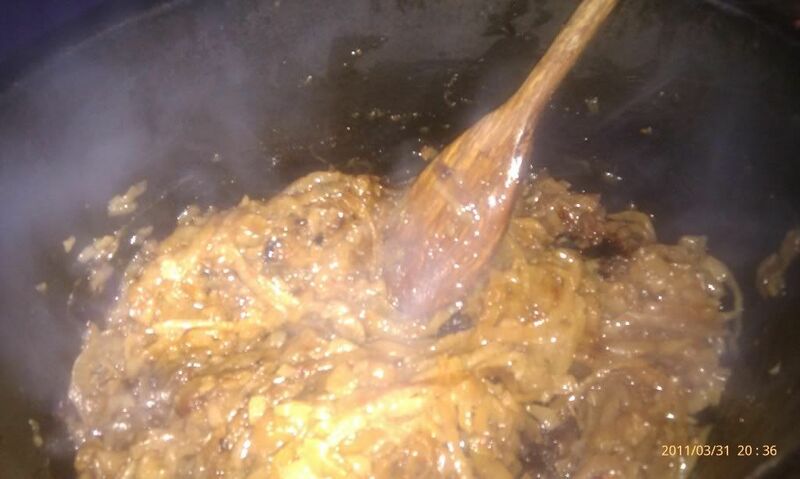 In case you don’t know, sugar + butter + heat = toffee/caramel, so we’re basically going to gently caramelise the onions. Yum! Thinly slice the onions (I slice mine so that I end up with thin rings as I like the melty long oniony bits you get in the finished soup) and crush the garlic, adding them to the buttery, sugary pan as you go so they start to cook. 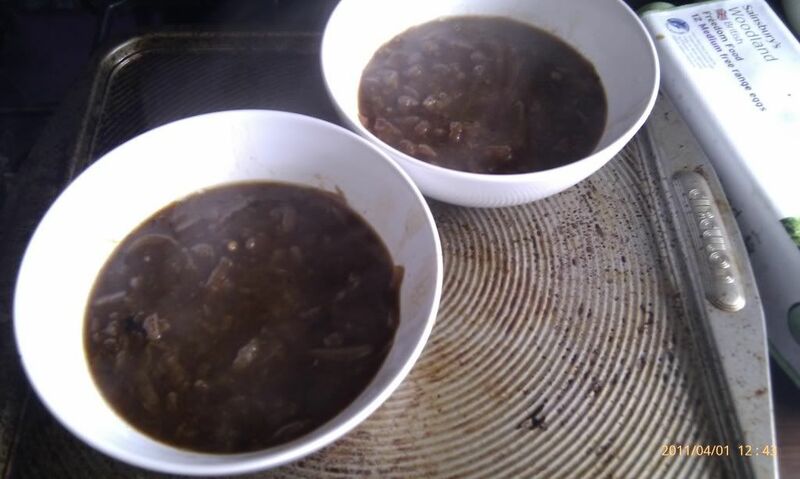 When the pan’s full of sliced onions, throw in some more flavouring – I used a good sloosh of brandy, a glug or two of worchestershire sauce, some black pepper and a teaspoon or so of vegetable boullion stock powder (a crumbled stock sube does the same thing). Stir it all up so the onions are all greasey, put the lid on and leave the whole thing over a very low heat for at least an hour, stirring only occasionally (i.e. when/if you remember). Don’t let it burn, but you do want the onions to caramelise to the bottom of the pan a bit as this is what makes it taste really yummy. 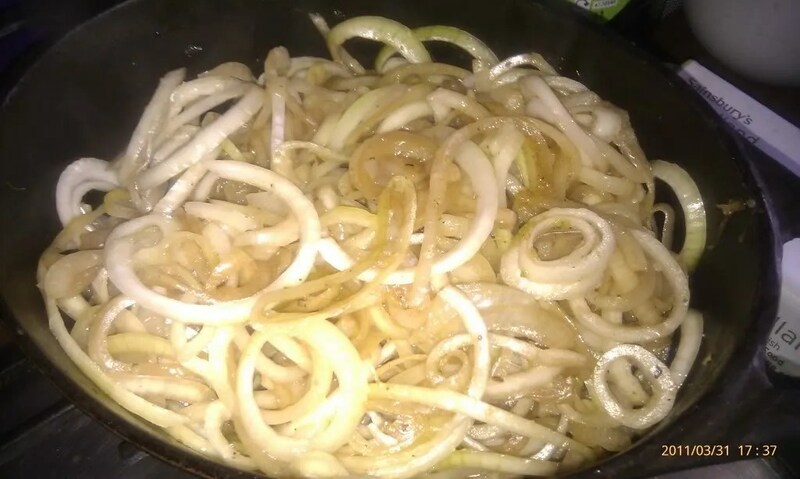 You should end up with well golden/browned and very very melty onions all coating the bottom of your pan like the picture above. 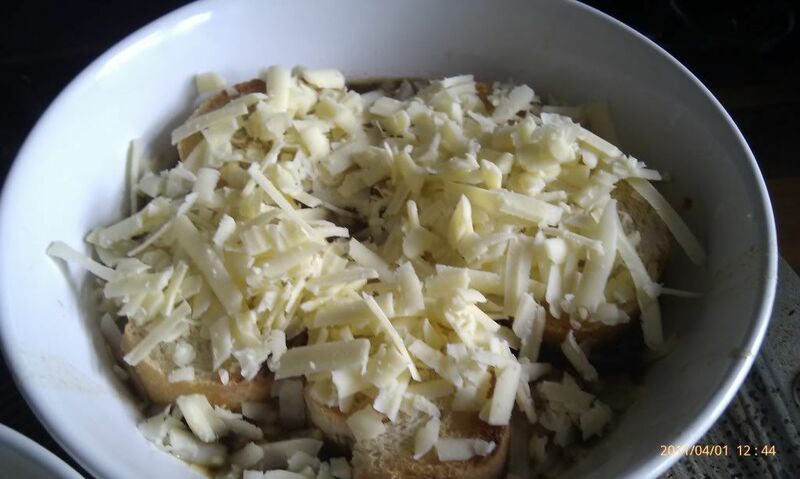 Boil a kettle and pour as much as you think it needs into the onions. 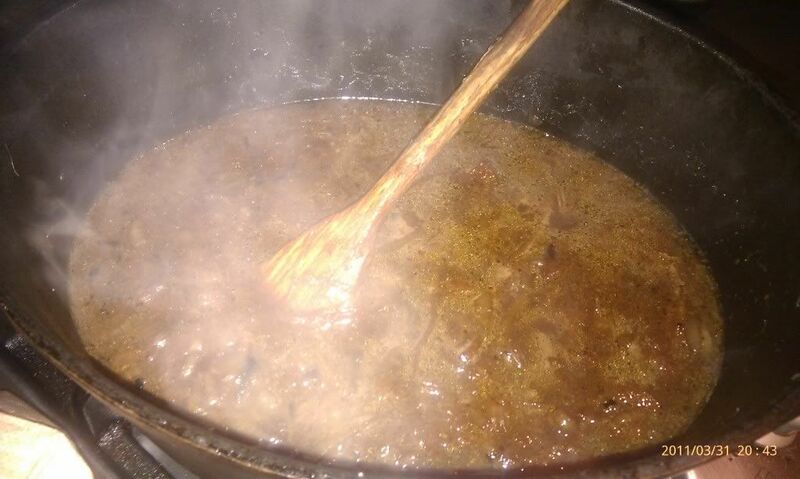 Use a wooden/plastic spatula to scrape all the caramelised onion off the bottom and sides of the pan (this is all the lovely flavouring, so make sure it’s all in the soup). 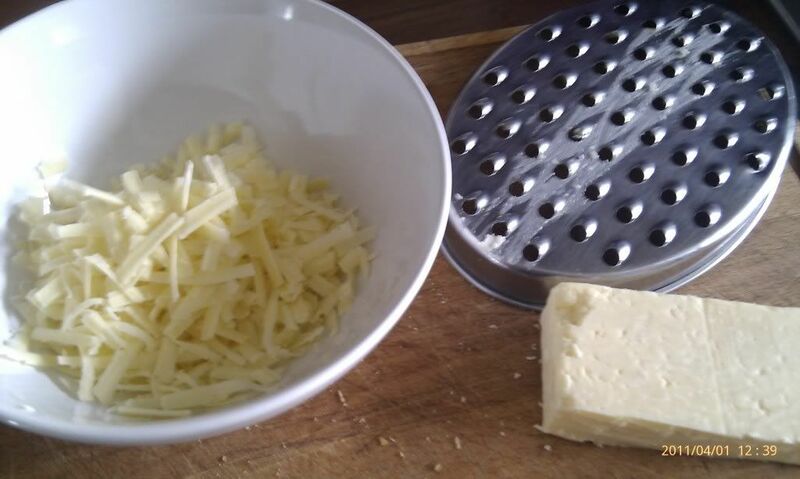 Taste and add water/flavouring as you like. 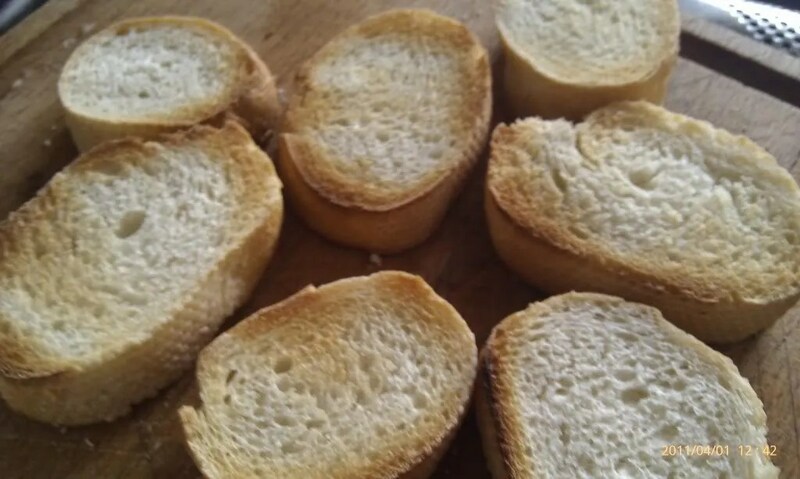 Now toast some slices of french bread to make big croutons and grate some cheese. 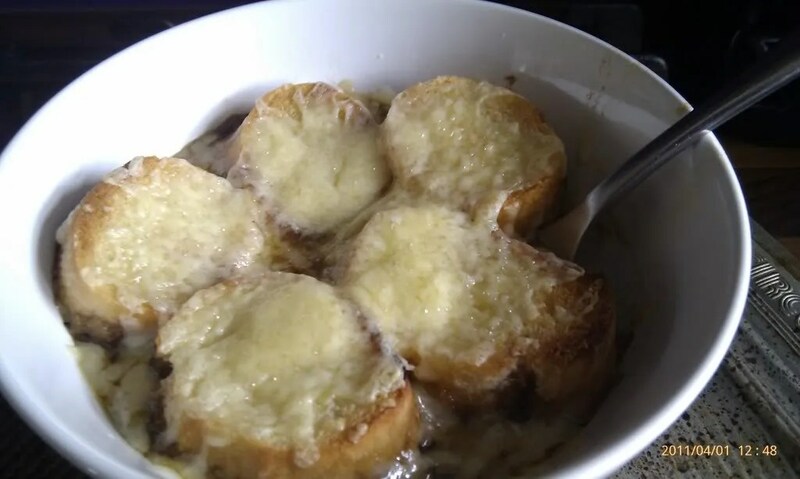 This entry was posted in Kitchen, Satisfying Things and tagged cheesy croutons, French Onion Soup, onion soup, Super Easy Soup. Bookmark the permalink.